waiting for a new year. all we know is thirst. to quiet what remains of us. A bit about Mark: Mark Senkus was born in Detroit but has lived for many years in Michigan's Upper Peninsula in proximity to the Delirium Wilderness, a part of the Hiawatha National Forest. He works as a psychotherapist for a Native American tribe. 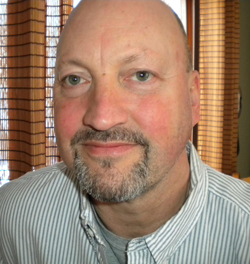 His poems have appeared previously in Mad Swirl, and also in Potomac Review and Miller's Pond. Senkus has several chapbooks of poetry available by inquiry to Mark Senkus, 893 Superior Street, Sault Sainte Marie, MI 49783.